The Roger Miller Show Storyboards: England Swings (details). 1966. Concept by Mason WIlliams. Drawings by Ed Ruscha. Alden Projects’ Work For Hire: Ed Ruscha & Mason Williams (October 30 – November 29, 2015) is the first exhibition of unique drawings made by Ed Ruscha produced in tandem with his life-long friend, and fellow artist, Mason Williams for storyboards giving form to narrative ideas for a 1966 television show, The Roger Miller Show. The series featured the eponymous country singer, fellow Oklahoman, and fabled writer of the classic Pop song, “King of the Road” (1965)—a particularly serendipitous, peripatetic association for the royal road testers, Ruscha and Williams. Produced at the same time as the duo co-authored and co-published Royal Road Test (1967), all of The Roger Miller Show Storyboards (1966) were intended as “cold openings”—the dramatic action that happens prior to a show’s titles. Executed on pre-printed storyboard panels, they are divided into two sections: a lower panel for Williams’ type-written, narrative directions and the larger, television-shaped panel above for Ruscha’s renderings in graphite, marker, and gouache. All are consecutively numbered by Ruscha. The Roger Miller Show Storyboards were created at a moment in time when Williams, in his salad days, imagined the medium of television as a potentially rich, creative space for art and for fine artists. And for this reason, he personally invited his close friend, Ed Ruscha, to work together with him on his first stab at writing for television. (The concepts and drawings were executed between April – August 1966). Too subversive, too self-reflexive, and too ahead of its time, the producers rejected the storyboards as well as Williams and Ruscha’s adoption of the visual storyboard format, saying: “We don’t use storyboarding. All we go by is a script,” Williams recalls. “I had thought that television, being a visual medium, was a place for artists to express ideas visually. I think me and Ed and TV lost out on this.” Nevertheless, The Roger Miller Show Storyboards remain potent signposts for roads not taken by the pair of artists together. Unlike Warhol’s work-for-hire drawings from the 1950s, the storyboards were executed during the beating heart of Ruscha’s signal era of the 1960s when in the midst of conceiving his most groundbreaking work-- particularly his perplexing publications which the artist himself considers to be his most important work. (Both Every Building on the Sunset Strip and The Roger Miller Show debuted in September 1966). Also contrary to Warhol, Ruscha’s storyboard drawings differ dramatically in context, purpose and scope. The Roger Miller Show Storyboards were created at Mason Williams’ personal invitation to his roommate, frequent co-conspirator, and sometimes collaborator who had driven across Route 66 from Oklahoma to Los Angeles with him in 1956, and whose impulse to include Ruscha in his very first days of visualizing for television was expansive: to open the door to an ongoing, creative collaboration with a kindred spirit. Suddenly finding himself “in the money,” as Williams put it, his first gesture in April 1966 was to share the opportunity with his roommate. The pair also shared, for example, a love of Dada-like capers, word play, graphic signs, fonts, titles, and subversive humor—all of which are evident in The Roger Miller Show Storyboards. Williams briefly continued writing for the King of the Road, and later, for the Smothers Brothers’ variety show, though he changed his tune portentously concerning the potential for advanced artists (and musicians) in television only a couple of years later, after encountering some well-chronicled road blocks. (Williams moved away from Hollywood in 1971). But this exhibition looks back to a particular moment in time in 1966 before the road diverged when two not-quite-famous-yet artists nearly took art, music and television on another convention-subverting road trip through the nascent matrix of inter-media. The Roger Miller Storyboards are a glimpse into what that world might have looked like. Williams, after all, had only fallen into television by chance after working on the early West Coast folk circuit, writing (and producing) songs for The Kingston Trio and publishing peculiar books (inspired by the example of his Los Angeles roommate). Williams was hired to write for television on a fluke: Roger Miller ran across his first book, Bicyclists Dismount (1964)--with photographic covers by Ed Ruscha--on a coffee table in Hollywood and decided that the Oklahoman should be hired at once. In addition to his work-for-hire drawings for The Roger Miller Storyboards, Ed Ruscha also produced other such art with Mason Williams, including the cover of Mason Williams 1969 long-playing record, “Music”. Ruscha’s ultra-distilled cover (created, like the storyboards, together with Mason Williams), consists of the dead-pan title, a single word: “music” mechanically printed on top of Ruscha’s hand-painted, color-fading ground. The art was initially rejected by the executives at Warner Brothers who objected to the unconventional omission of the recording artist’s name (Mason Williams) on the front cover. Ultimately, the conflict was resolved after Williams agreed to have his name printed on a sticker affixed to the top of the disposable shrink-wrap—thus preserving the integrity of the art and its punchy minimalism. Ruscha’s credit is noted at the bottom of the back cover: “Sorry, cover by Ed Ruscha”--a final, sly wise-crack aimed at the record executives who didn’t want the concept/design in the first place. Anecdote: the hand-painted elements of Ruscha’s artwork for “Music” no longer exists, having been discarded long ago by Warner Brothers executives. 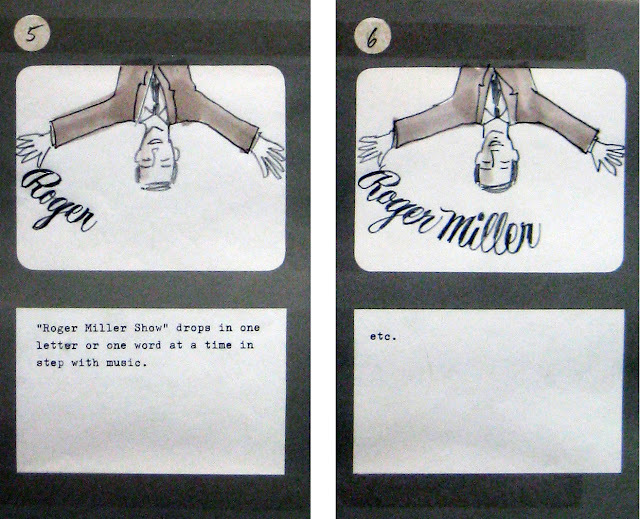 Fortunately, Williams and Ruscha valued The Roger Miller Storyboards enough to preserve them. They make an abbreviated appearance in Mason Williams’ artist’s book, The Mason Williams F.C.C. Rapport (which was originally assembled to present before the Federal Communications Commission in 1969) to address urgent questions about the relationship between art, creativity, and television. This is the first time that The Roger Miller Show Storyboards have been exhibited publicly. Work for Hire: Ed Ruscha & Mason Williams is the second part of a two part exhibition at Alden Projects™, following Double Standard: Ed Ruscha & Mason Williams 1956 -1971 (September 10 – October 18, 2015).